I’m quite fascinated by the carpenter Joseph in the Nativity story and what it must have been like to have a son who was a messiah. Family life is puzzling enough without divine intervention from the get-go! So let’s focus in on a memorable moment for Joseph. Joseph has been nicknamed “Joseph the Just” because he is described as a “righteous man” (Matt 1:19). This phrase usually refers to a person who obeys the law carefully. Such rule followers don’t bend the rules for favorites. Maybe you’re a little like this, thinking, Why can’t everybody just follow directions? It would be so easy. The rule Joseph faced when he discovered that Mary was pregnant dictated that she should be stoned (Deut 22:23; for legal purposes, she was already his wife). But because Joseph was ‘just’ he decided to set aside the law of Moses. Instead of publicly exposing her, he would divorce Mary “quietly.” In other words, he didn’t press charges. “He possessed the boldness, courage and strength of character to stand up against his entire community and take Mary as his wife,” says Ken Bailey. So far, so good. “Joseph the Just” may have been a nice guy, but nice guys still hurt. How did he feel? He resolved to do divorce her quietly. The word for “resolved” (enthymeomai) has two meanings: 1) to consider or ponder; 2) to become angry. In other places in the New Testament, versions of enthymeomai are translated “wrath” and “rage.” Why not here? Because Joseph is regarded as a saint and saints don’t get angry? Plus, nobody gets angry with Mary!? But Joseph was human. If you were betrayed by your fiance, would you sit quietly and ‘consider’ the matter or would you feel disappointed and betrayed? Let’s at least concede he could have been very upset. If he perhaps fumed over the situation, that would not make him any less honorable. For in his fuming, he accepted the outlandish news from the angel that Mary’s pregnancy was the work of the Holy Spirit. Willing to be a thought a fool by his community, Joseph not only accepted Mary but also took her with him on his journey to Bethlehem—perhaps to protect her from possible stoning in Nazareth? Even though Joseph was no doubt persuaded in his conversation with the angel, it’s a long journey from fuming in resentment to being willing to bear public shame, to let resentment morph into mercy. He moved from being accusative to being restorative. His anger was reprocessed into grace. As years passed, Jesus would have known what Joseph did. Is that why he told a parable about a shamed person who became merciful (an insulted host of a banquet who invites street people to join him, Luke 14:16-24)? Did Jesus get his ideas of how a man really behaves from the carpenter-father who apprenticed him and raised him? Maybe you’re struggling with anger or feeling betrayed. Consider the possibility that God can help your anger be reprocessed into grace. You also could be restorative instead of accusative. You don’t think so? Please take a minute and be still. Then imagine yourself as Joseph feeling deeply betrayed. Then the Spirit invites you to do a truly superhuman thing: to let it go, to stop blaming, to require no explanation. To grin instead of get even. If God empowers you to do this, it will be a beautiful thing. Can you try it on for a few minutes? Why am I sending you a Christmas story now? Advent is 2 ½ months away, but you might want to consider having an Advent group at your church, or doing Advent with your family or moving through Advent day by day yourself. 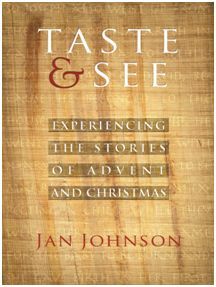 If so, moments like the above are included in my new Advent guide, Taste and See: Experiencing the Stories of Advent and Christmas. (The calendar keepers at your church will want you to plan now!) You can walk through these historic events with down-to-earth but seeking eyes, experiencing the events as you have not before.